Links golf courses are situated along coastal regions. A links golf course is the oldest style of course. The word “links” is derived from ancient Scotland and refers to an area along a coast that often includes sand dunes and few, if any, trees. One reason the game originated on this type of land was because it suited play. Course designers had limited resources for moving earth to shape a course. Many modern links-style courses are not necessarily coastal and have been shaped to take on traditional links characteristics. In Scotland, where golf is believed to have originated in the 15th century, the first courses were developed on stretches of land known as links. Farmers deemed these coastal lands useless because of the sandy soil, so golf course designers began to make use of them. There are a number of true links courses still open for play in Scotland, including the course that has become known as the home of golf --St. Andrews. Ireland, Wales and England also have true links courses, but Scotland is believed to have the most. 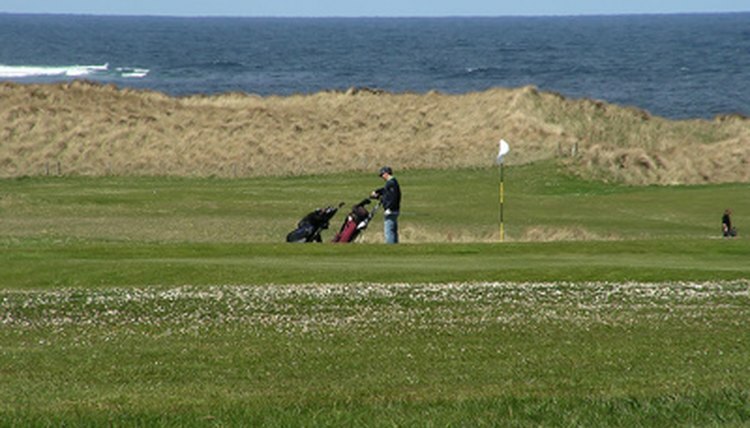 A links course is along the sea, consists of sandy soil and has little vegetation other than tall sea grasses and gorse, a hearty low-growing evergreen plant. The natural terrain is used to develop the golf holes. Many of the bunkers were once natural windswept dunes. The layout of the holes is also part of a true links course, with the first nine going out to the farthest point from the clubhouse and the second nine bringing you back. St. Andrews, Royal Troon, and Royal Dornach are considered three of Scotland's most famous and most traditional links courses. In Ireland, there are also traditional links, including Waterville, Ballybunion and Lahinch. The United States also has several famous links courses. One of them is the highly ranked Pebble Beach. Sinnecock Hills in New York and Bandon Dunes in Oregon are also traditional links. The look of links-style courses can vary greatly. Most are developed by designers to look like traditional links courses. There are no trees or very few, and the land has subtle rolling terrain. However, many links-style courses are not built along the coast. Professional golf instructors will advise players to adjust their playing style when going out on a links course. Generally, the game is played closer to the ground. Since the terrain on a links course is naturally firm, players employ more bump-and-run shots. Putting from close off the green is also encouraged. And keeping your ball flight low helps to lessen the effects the usually brisk coastal winds have on your ball flight. Worldgolf: The Debate Rages About the Meaning of "Links"
Sports1234: What's the Definition of a Links Course in Golf?